This family owned business began as a movie and game rental store in 1990. In 1997 it began the transition to a dedicated family game store and now has over 6000 unique games featuring over 21,000 retail items including various board and card games, puzzles, roleplaying games, trading card games, collectibles and some specialty items. This one-of-a-kind retail location centre also lends itself to hosting special gaming events and tournaments. 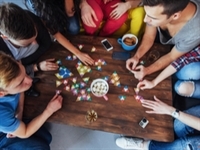 The games room has tables and chairs for family and friends to enjoy an evening of board games. A canteen offers food and refreshments. This profitable company maintains a user friendly website, offering customers to the ability to purchase items online at competitive pricing. Located in the St. Albert with easy access off major roadway. Plenty of retail space, room for physical expansion of the building, recent upgrades and attractive curb appeal. This unique board game retail venue easily competes with other toy and game stores, due to the multitude of entertainment features, appeal to multi generations and the inviting features of the store as well as on-line retail features. Owner would like to semi-retire.